I wrote this to help folks that are new to Future Pinball although I have gotten reports that some older members learned a few things too. Most of the information here is available at different locations on the forum but this posting combines everything new members need to know to get started and will help you to avoid the pitfalls that can be frustrating. The "Basic Guide" will step you through the initial installation and set up so that you can get Future Pinball functional and able to play any table. If you are new, you will want to stop at the end of the Basic Guide and come back later when you are ready to learn more. The "Intermediate Guide" (starting st Step 17) describes changes and enhancements that you can make to existing tables without having to delve into anything too deep. This section basically helps you to change things that you want to change or don't like on some tables. The "Expert Guide" (starting at Step 25) has links to guides on how to build tables and other advanced topics. I have preceded some of the step numbers with the word "Hot!" if there have been a lot of questions about the topic on this forum. If you have Future Pinball and BAM installed but are having trouble, I suggest you read these "Hot!" topics. If you have problems with the program crashing or not performing well, you should read Steps 6, 12 and 17. 1. The first step is to install the program. There are some old versions of Future Pinball still available in a few places. I have only verified that the download from these locations to be the most current and correct version to install. You may have a desire to install Future Pinball in the same folder as your other programs and there is nothing to stop you from forcing it to install there but it just won't work properly if you do. Most of the guys install Future Pinball to the default folder. Some of the guys have more than one drive on their PC and install it there. The problem is that the program needs to be able to write files to the program folder and Windows will not allow that to occur when you install Future Pinball to either of the above folders. The program should function properly as long as you avoid installing it to either of the above two folders. These folders function in exactly the same way as the above two "Program Files" folders in English. For this reason, avoid installing Future Pinball in these folders. I also assume that you have Windows installed on your C drive. If you don't have Windows installed on your C drive, substitute the letter of your drive for the C above. Hot! 3. After the program is installed, right click on the Future Pinball shortcut, select "Properties" and click on the "Compatibility" tab. If you are using Windows Vista or Windows 7, add a check mark to the option, "Run this program in compatibility mode for". Then select "Windows XP (Service Pack 3)" from the pull down list. Then put a check mark in "Disable display scaling on high DPI settings". Put a check mark in the option for "Run this program as an administrator". The other options may be left unchecked. On Windows 8 and 10, most (but not all) of the guys use "Run this program as an administrator". Some need to use "Disable display scaling on high DPI settings" in order to make tables look sharper. In some cases, tables may not look correct at all if "Disable display scaling on high DPI settings" is left unchecked especially if you rotate the display on your monitor. Note that if you place a check mark in the option for "Disable display scaling on high DPI settings", all of the icons on the main screen of the Future Pinball editor will become smaller than if the option is unchecked. Also if you check this option and use a high resolution monitor, the script may not show the left most portion of the line numbers. When the script is open, you can hold the "Ctrl" key down and then move your mouse wheel. You can reduce the size of the font and then be able to read the line numbers although this may make the font too small for you to read. Right click on the file "Future Pinball.exe" and select "Properties" and click on the "Compatibility" tab. The data from the shortcut should have transferred to "Future Pinball.exe" when you opened Future Pinball. Verify the data is the same as what you entered for the shortcut. I have a few favorite tables listed below that are Physics 1.0 that you will be able to play before installing BAM. Note that the name of the table is clickable and will bring you to the web page where you can download the table. Bond 50 (Anniversary Edition) 1.0 – This is an older table that I like. TutenKham 1.0 – This is a rather exotic table that is really fun. It has a trick that if you hold both flippers down as a ball drains, it will kick the ball back out instead of loosing it. Sci-Fi Classic 1.1 - This is the first original playable Demo table. It is still pretty good. It downloads as a zipped *.exe file where the default installation is to the folder C:\Program Files (x86)\Future Pinball. You will need to change the install to C:\Games\Future Pinball\. Cadash Fantasy Pinball 1.1 – Wild built this table not long ago and I tested for him. It is based on a video game. He has a sound track from the video game and a different rock sound track that you access by pressing special key 2. The Shadow 1.0 – This is actually a ZedPinball table that I said you can't use yet. The Zed version was created by Skinooe who posted on the "Info" tab on the web page that the table is also playable with FP 1.0. I personally prefer playing it with 1.0. Skinooe also made some changes to the table that make it play better than the original version. You may want to save the *.zip files included in the download so you can try them when you install BAM later. 5. It would probably be best to start your downloads with the first two on the list above ("Bond 50" and "TutenKham") because the unzipped download file only contains a single *.fpt file. You simply move this file to the C:\Games\Future Pinball\Tables folder. In addition to the *.fpt table file, the other table downloads come with library or *.fpl files. These *.fpl files should be placed in the C:\ Games\Future Pinball\Libraries folder. The library files will function properly if you save them to the "Tables" folder but they tend to add to the clutter in this folder especially if you download a lot of tables. You may have noticed that if you installed the "Sci-Fi Classic" table, the *.exe file saved the library files to the "Tables" folder. You can move these two *.fpl files to the "Libraries" folder if desired. The "Sci-Fi Classic" table is the only table I have ever seen that downloads as an *.exe file. All the other downloads have the previously discussed file types. Some table downloads include images and other files that are for information purposes and are not required for the table to function properly. If you are curious, some downloads contain images that can be added to graphical front end loading programs such as PinballX or HyperPin but you won't need them unless you are performing a cabinet install. You can rename the *.fpt files. I usually rename table file names so they are the same as the name that is displayed on the web page where I downloaded it (which will include the version number). That way I can easily go back to the web page where I downloaded the table for reference and also determine if a new version has been posted. Do not rename the *.fpl library files. When you open a table, the table file searches for specific library file names so you don't want to rename them. If you are missing a library file when you attempt to open a table, you will get an error message listing the specific name of the library file that is missing as you open the Future Pinball program. There is also an fpRAM subfolder in your Future Pinball folder which has *.fpRAM files. This folder will be empty until you open your first table. The *.fpRAM files are automatically saved from tables and contain the high scores where you enter your initials. The *.fpRAM file names will have the exact same name as the table. If you rename a table that you have played before, you will need to rename the *.fpRAM file with the same name as the table if you want to keep your high scores. If you open a table and click on the "Table" pull down menu and select "Table Info", you will notice that there are some "High Score Defaults" that the author may have entered. These are saved to the *.fpRAM file for the table when you play a table for the first time and they will appear as high scores. Personally, I prefer to enter my own high scores so I always delete these before I play a new table. There is also a button on this screen called "Reset fpRam File to Default". All it actually does is deletes the *.fpRAM file and then the table will create a new *.fpRAM file the next time you play the table. Hot! 6. Before you play a table, open the Future Pinball program. The first screen that you will see is the Future Pinball editor. Click on "Preferences" menu item in the editor and select "Editor Options". Uncheck all options on this screen, especially the option "Load Image into Table Editor". If you don't do this, you may have problems with Future Pinball crashing or the table may open with a solid silver or black top. The options on this screen would only be useful to someone who creates tables so you don't need to know what they are. The Future Pinball default install does however have some of these items checked so you will need to uncheck them. You should read the sections "Welcome", "Editor Overview" and "Playing a Table" of the Help or the first 20 pages of the *.pdf version. This part of the manual contains the basic information that you need to play the game like how to launch the ball etc. Don't be alarmed when you see the *.pdf version of the manual has 483 pages in it. You will only need to read 34 pages. The manual includes some discussion of a table launcher that I personally never use. It is slow to open if you have a large number of tables and contains little more information than the file name. I find it is better to use the "File" > "Open" command to open tables until you install a launcher (discussed later). 8. The next section of the manual that you should read is about the "Video / Rendering Options" screen. Double click on "Preferences" in the Help and read the "Video and Rendering Options" section or read pages 157-165 of the *.pdf manual. This entire section is all about this one screen in Future Pinball. I have posted a screen shot of the settings that I use below. These settings provide the best quality display that is possible although the settings are also the most demanding on your system. I suggest you start here though you may need to make some adjustments when you get to Step 12. You may note that I do not have a second monitor so the first item under "Screen Resolution" is grayed out. The manual includes information on how to set up a second monitor to display the backboard of the pinball table. The native resolution of my monitor is 2560 x 1440 so I set the resolution on this screen to match it. You need to check "Full Screen" first before you adjust the screen resolution. The easiest way to determine the native resolution of your monitor is to open the Windows "Control Panel" and open "Display" and then open the resolution option. The native resolution of your monitor will normally have "(Recommended)" listed beside it. You can see that I checked "Vertical Sync" in the above screen shot. This needs some explanation. The frame rate is displayed in Future Pinball by pressing F9 for "Frame Rate and Statistics" while playing a game. If you play a table with "Vertical Sync" unchecked, the FPS displayed will often read 150 frames per second (FPS) when you press F9. If you play a table with "Vertical Sync" checked, then the FPS will not exceed 60 FPS. According to Popotte, the FPS that displays when you press F9 is actually the FPS that the CPU/GPU produces, not the FPS on your screen. If you have a screen with a refresh rate of 60 Hz (which is common for most screens) and pressing F9 indicates you have 150 FPS, you actually just have 60 FPS on your screen. If you have a screen with a 60 Hz refresh rate and more than 80 FPS on all your tables, you need to check Vertical Sync (no tearing and sluttering). But if your FPS is sometimes under 60 FPS, then you should uncheck Vertical Sync in order to avoid very low FPS and stuttering. My PC always plays tables which exceed 100 FPS and I have found having it unchecked causes weird problems. On the table "Star Trek, the Next Generation", I have a problem with the ball dropping through the playfield like nothing was there unless I have "Vertical Sync" checked. I have found what I would call strange behavior on other tables if I don't have "Vertical Sync" checked. ...So the short story is try several tables with "Vertical Sync" unchecked. If you exceed 80 FPS on all your tables, then check "Vertical Sync". If the FPS is less than 80, then uncheck "Vertical Sync". If you continue to have low FPS, you should read my discussion about stuttering on step 12. Notice that I have "Anisotropic Filtering" unchecked. The manual says that this option can improve the visual quality. I've tried it but found no improvement on my PC so I unchecked it to save on resources. You might want to try checking it to see if you get any improvement. a. Not often but occasionally some of the guys have a problem with the screen flickering and sometimes it makes a noise. This is solved by adding a check mark to the option for "Vertical Sync". b. Occasionally some of the guys on the forum have a problem with the display of the room (the area around the pinball table that you are playing). The problem is that some of the pinball tables in the room cut through some of the objects in the room. This is caused by a default game room that is generated by Future Pinball over lays on top of the room created by the author of the table. The solution is to uncheck the option "Render the Game Room" which turns off the default game room. I have found most authors of tables usually create a game room so it is best to leave this option unchecked. c. Most of the guys prefer having the Dot Matrix Display (DMD) a yellowish orange color. If you place a check on "Disable GLSL Shaders", the DMD will turn white. This option should be unchecked for most users but it is provided for compatibility for video cards that are +10 years old. 10. The only other section of the manual that may be of interest to you but only if you want to change the default keys that are used to play the game. This is the "Game Keys and Controls" section which is also listed in "Preferences" of the Help or pages 152-156 of the *.pdf version. The rest of the manual basically describes how to create a table which you don't need to know at this point. Hot! 11. OK. You can now finally play a table! Have some fun! Be aware that Future Pinball has a memory leak. You will have problems unless you completely close Future Pinball and restart it after running every table. There are some launchers that do this for you. There are the "PinballX" or "HyperPin" launchers that are normally used if you have a pinball cabinet. Performing Step 18 will also solve the memory leak problem if you don't have a cabinet. • Your antivirus program can have a huge impact on Future Pinball's script performance. You may try to disable it. Remember that Window 10 has "Windows Defender" installed and has real time protection that you can turn off temporarily. What can happen is the script may execute something that the antivirus considers to be a potential threat so it scans it which requires CPU power. The antivirus tends to rob memory from Future Pinball and can make the ball stutter. This is especially true when the script has "execute" commands. I have a higher end gaming PC and have experienced stuttering on tables that have "execute" commands in the script. You can find these commands by searching the script for the term "execute". A good coder might be able to figure out a way of replacing "execute" commands with other coding. • You can change the lighting model in BAM. On most graphics cards "FP Original" is faster than "New Renderer" althouigh on some notebooks "New Renderer" is faster. You should try both. • On your computer, make sure you have set the profile to "maximun performance" in the power manager. • Anything that can use your graphics card can decrease game performance. This would include anything in your web-browser. Close all browsers when you play Future Pinball. a. Try Bilinear Texture Filtering instead of Trilinear. I have found there is very little penalty for making this change and you will probably have tables load faster. b. Uncheck "High Quality Textures". c. Try 16bpp instead of 32bpp. d. There are some Presets at the bottom of the screen that change the Rendering Options . When I set this screen up for the first time, I clicked on "Maximum" but then unchecked "Render the Game Room" which is automatically checked. Try clicking on the "Medium" or "Minimum" options but after you do this be sure to change "Model Quality" back to "High" and uncheck "Render the Game Room". It may seem counter intuitive but some of the guys have had problems loading tables because "Model Quality" was not set to "High" even on lower end PCs. e. Place a check on "Disable GLSL Shaders" if you have an old video card. Although the DMD will turn white, having this item checked will make Future Pinball use an older version of OpenGL that is compatible with older hardware. f. Also if you have an old video card like S3 Virge or Voodoo 1, try unchecking "Enable Non-Power of 2 Textures". g. Try reducing the number of "Hardware Lights to Use". h. Uncheck "Flares on Flashers". i. Uncheck "Flares on Playfield Lights". j. Try adding a check mark to "Use Texture Compression (S3TC)". "It is important to note that ALL textures should have dimensions which are a power of two (i.e., 64, 128, 256, 512, 1024, 2048, 4096) for both the Width and the Height of the texture (though they don't necessary have to be the same). This is a limitation with the video card and not Future Pinball. If the Texture you wish to add to the table is not of a power of two, then the Future Pinball will automatically re-scale the image to its nearest power of 2 dimension when the game is run, so it is best to ensure that all textures follow these rules as it makes the loading of textures into the video card much faster if it doesn't have to rescale the image first." 15. There is some basic information about Future Pinball here. 16. The first resource you might want to check out is my list of best tables (see link below). I provided links to where I downloaded the tables. I also describe the changes I have made to them to solve problems I encountered. Some of the techniques I use are described in Step 19. IRPinball is primarily dedicated to the older style electromagnetic (EM) pinball tables. Note that later tables are solid state controlled which are often equipped with Dot Matrix Displays (DMDs). This is all that a beginner needs to know. You can read the more advanced guides below later. If you haven't installed BAM yet from Step 13, you need to install it now. I have read that the Zed64x has issues with some other programs that work with FP….mainly Future DMD (many images on the DMD won’t display), and DOFLinx which allows for DOF feedback and lighting, SSF, and PUP Videos (Zed64 can cause crashes in this case). I don't have a way to test this so I don't know. If you have problems, you might try one of the other Future Pinball executables, all of which are posted in the link above. The problems with memory management may not be bad as it used to be because some of the newer versions of BAM have fixed some memory leaks. Then you just change the 3 to a 5 (or the number of balls that you wish). Some of the older tables unfortunately do not have this script and rely on the default number of balls per game which is 3. On these older tables, you can usually add "nvBallsPerGame = 5" below the line that says "FuturePinball_BeginPlay()" and it will usually work. In some cases however you may get an error changing the balls per game, because the DMD may be configured to have only 3 balls, or the script base may not depend on nvBallsPerGame. If this is the case, there is not an easy answer. If this does not work, you can post a question on the forum like I did. b. Another easy change is you can change the line in the script that begins with "Const constBallSaverTime" in order to give yourself more time to get a free ball if you loose it quickly. The time is listed in milliseconds so one second = 1000.
c. Some tables have script for "MusicVolume" and "SoundVolume" where you can adjust volume of the music and game sounds played during a game. You should however only use this option if the volume of music vs. game sounds in out of adjustment for the specific table you are adjusting. If all your tables have the volume of music vs. game sounds out of adjustment, then you should follow the directions in the manual for adjusting these sounds. The manual says, "If the sounds are too loud or too soft then you can adjust it via the Home (turn volume up) and the End (turn volume down) keys on your keyboard. If the music (if any) is too loud or too soft then you can adjust it via the Page Up (turn volume up) and the Page Down (turn volume down) keys on your keyboard." d. Occasionally a table will be great except if it has an obnoxious sound that you don't like. If this happens, you need to click on the "Table" menu and select "Sound Manager" and play each sound until you find the one that you don't like. Then you click on "Rename" and then hold down the "Ctrl" key and type "C" to copy the name to the clipboard and then close the sound manager. Then you can search the script for the sound name and change it to something else, possibly another sound in the "Sound Manager". Or you can inactivate it with an apostrophe before the line of code that precedes it. The sound may be referenced in the script more than once so you will want to change all occurrences. If you can't find the sound in the "Sound Manager", try the "Music Manager" on the same menu. The 0.3 is the volume of the sound. You can change it to be a value between 0 and 1.0. In some cases, the playmusic line will end in TRUE or FALSE or the playsound line may end with the name of the sound, in that case just add a comma and the number. a) There is an option on the "Lights" screen in BAM. It doesn't matter whether you have Forced Arcade Mode turned on or off. It is always there. You will see an option called "Lights" on the main menu or one named "Table and Lighting" then "Lights" under that menu. The option to make the table lighter or darker is available under the option called "Presets". If you have never changed it, the option will probably say "default" but you can down arrow to the option and use the right arrow button to open "Day", then "Bright Day", then "Night" and finally "Dark Night". These options are intended to change the brightness of the table so you can display the table with a brighter screen during the day and a darker one at night. This option appears to work nicely when you are changing a Day or bright table into a Night table. It is not so hot when trying to change a dark table into a "Day" or brighter table. b) There is an option in Future Pinball that many of the table authors use to make a table darker. It is called "Playfield Color" that is on the right side of the screen when you first open the editor without clicking on anything on the table. Table authors often set this to a shade of gray to make the table darker. When you click on this option, a color palette opens and you should click on the button to "Add to custom colors" so you can revert back to the original color if desired. Then you can move the slider on the right up or down to make the table lighter or darker. You would probably be better off starting here to make a table brighter and then adjust the BAM lighting settings. a) You can identify the name of the of the playfield texture by opening the Future Pinball editor. Do not click on anything on the table and look at "Playfield Image" in the right pane. There are a few tables that use several images on the playfield and this field may be blank. b) If you want to be able to see the images in the editor, you need to place a check mark on one of the options in Step 4 that I told you to uncheck. Open the Future Pinball editor and click on the "Preferences" menu item in the editor, select "Editor Options" and check the option "Load Image into Table Editor". Then you need to close the Future Pinball editor and reopen it which will then load images into the editor. c) Click on the "Table" pull down menu item and select "Texture Manager". Then you can click on the first item in the "Texture List" and use your arrow down key to browse through the images on the table. You can look through the list and may find a playfield image that has a different file name from what you saw in the "Playfield Image" field of the editor. You can change the playfield image by going back to the editor and clicking on the pull down beside the "Playfield Image" field and select the image that you want there. If you don't see an alternate image in the list, you can export the image and edit it and then import it again using the "Export" and "Import" buttons. d) Plastics often have the same shape as the playfield but display the tops of the apron, slingshots and other objects on the table although they can also be individual images. To see the name of the name of the plastics image, you can click on the apron or other object on the table and look at the "Top Texture" field in the right pane. To change the plastics image, you can either go to each object on the table and make a change to the "Top Texture" field or it may be easier to delete or rename the existing image in the "Texture Manager" and rename the image you want to use with old name. e) When finished, be sure to go back and uncheck "Load Image into Table Editor" on the "Editor Options" or you will probably have problems playing your next table. 23. Miownkhan created some custom balls that you can add to any table. If you have the "World Cup Soccer 94" table, you need to try his soccer ball. The colors on the ball match the table perfectly. You can download his custom balls from the link below. The first posting on the thread has Miownkhan's custom balls that you can download. The second posting on the thread has directions on how to install and create custom balls. After you make the changes, you should test the ramps to be sure the ball travels up them smoothly. This is basically it. It just involves making changes, testing them, making changes and testing again until you get the characteristics you want. 32. This tutorial explains how to post a new table on pinsimdb.org. I always post a new topic on this forum under "Tables Release" before I post a table and then add a link to the forum topic when I post the table on pinsimdb.org. The "Links" section of the tutorial explains how to add the link. Also be sure to change the "Status" to "Waiting (for publish)" as described. The table will never be published if you leave the status as "Draft". If you have questions or want to suggest revising this post, please post replies to this topic. Last edited by GeorgeH on Sat Jan 19, 2019 3:36 am, edited 101 times in total. Being relatively 'New' to the Pinball / Future Pinball hobby, I believe that I had managed to find myself reading through pretty much all of the 'links' you provided; albeit over a number of weeks/months - and welcome a collective "Starting Point" for us Newbies. However, it may be worth 'Breaking-Down' the information being presented into almost a "PC Knowledge" related area; i.e. Basic/Intermediate/Expert areas - all of which could be synonymous with... perhaps a 'Pinball Set-Up'? 2 - Run the Install - allowing Future Pinball to install in the 'Default' installation path (C:/Games/Future Pinball). 3 - Change some of the 'Default' Future Pinball settings; i.e. 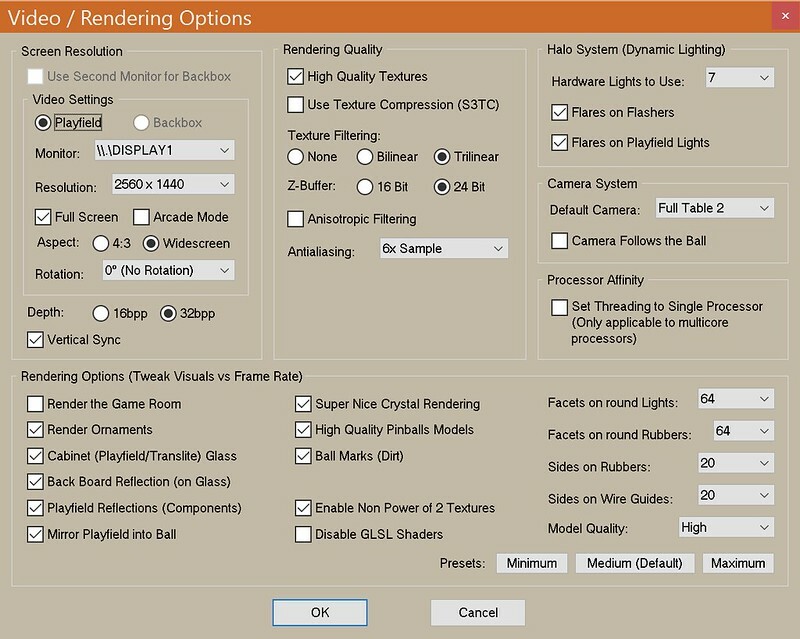 Video Rendering Options (specifically - "Vertical Sync" and "Model Quality" to allow for maximum initial playability (including a brief overview for these settings...(?))). INTERMEDIATE; Help with Dual screen set-up, 'Physics' , B.A.M. 7 - 3 screen set-up. 8 - LED Wiz etc. 9 - Creating 'Custom' Physics. I made the changes that you recommended. I decided to include BAM set up in the Basic section because it is needed to have FP fully functional. I wrote it however so that someone can play a few tables before BAM is installed. I figure someone new would want to play a few tables just to see if they really like FP. Sticked... And for your information, IRPinball is dedicaced (mainly) to old (EM) pinballs. Thanks guys! I fixed a typo I found on step 8. I incorporated Popotte's comment into step 16. I also incorporated some feedback I got from Gimli into step 19c. If anyone knows of any tutorials that would be good to add here, please let me know. Your explications are very nice, it's great!!. Also thank's to putting the direct links to my free 5 pdf guides, i have made so far. I think in time to create a 6th pdf guide, but oriented of how to use the software Milkshape3d. This so peoples can create there own ms3d files to put into the software FP. Also Mete Ciragan from Milkshape3d have givin me the autorizations to do printscreens of the software, so i can put some images of the soft milkshape3d to put into the pages. But the thing is that i dont know very much about the soft Milkshape3d, i have modeled more with Softimage XSI Mod Tool v6.01. When i asked to Autodesk a writing permission to do printscreens images of the Softimage XSI Mod Tool v6.01 for respecting copyrights, they have givin me a url link to some page of terms, that have so many things to understand; that i have abandonned the project to create a book on how to model with Softimage and do some printscreens of it. I just wanted to have an e-mail with a simple "Yes" to do some printscreens of there software. At leass Mete Ciragan have been very nice, i can say that i can do printscreens of Milkshape3d. I'm sorry I don't know anything about Milkshape3d. Can anyone else help 20degree? Thank's George for looking forward to help me! There is so many things to read, so many videos to watch. A thing that i think to put is to explain the coordinate letters (X,Y,Z). To explain it here this, if you would have an old computer screen "not the thin ones", but the one like some cube. If the coordinate (X,Y,Z) would be (0,0,0), the center point would be in the absolute center of the old cube computer screen. If you look at this old cube screen the coordinate (X) would be coordinations that are horizontal. The more you go to the left of the center of the cube screen, the more the value of the (X) is under (0) zero. Wich mean (-1), again more to the left and more and more, (-2), (-3), (-4); this the more you go to the left horizontaly of the middle of the 3d space. I think you have guessed the more you go to the right of your cube screen from the middle, the more the value of (X) is rising like (X=1) more to the right and more and more (X=2), (X=3), etc etc. The coordinations (Y) from the center of your old computer screen, the more you go to the top of your screen, the more the value of (Y) is positive; (Y=1), (Y=2), more to the top (Y=5), etc. etc. Again when from the center of the cube screen, the more you go vertically at the bottom of the computer screen, the more the value of the (Y) is negative; (-1), (-2), (-3), etc. etc. Now the coordinations (Z) again from the absolute center of your old computer screen, the more you go to the front "where you see your screen"; the more the value of (Z) is set positive. But from the absolute center of your computer screen the more you go at the back of your old computer screen, then the value of (Z) is more negative; (Z=-1), (Z=-2), (Z=-3), etc. etc. Well there is so many things to learn. But you are my motivations guy's! I'm glad to help. I'm not perfect, and i try to explain things very simple. Please correct me if i'm wrong, i want to teach beginners and others correctly. That is an amazing post, well done. I have a much better understanding of FP now.